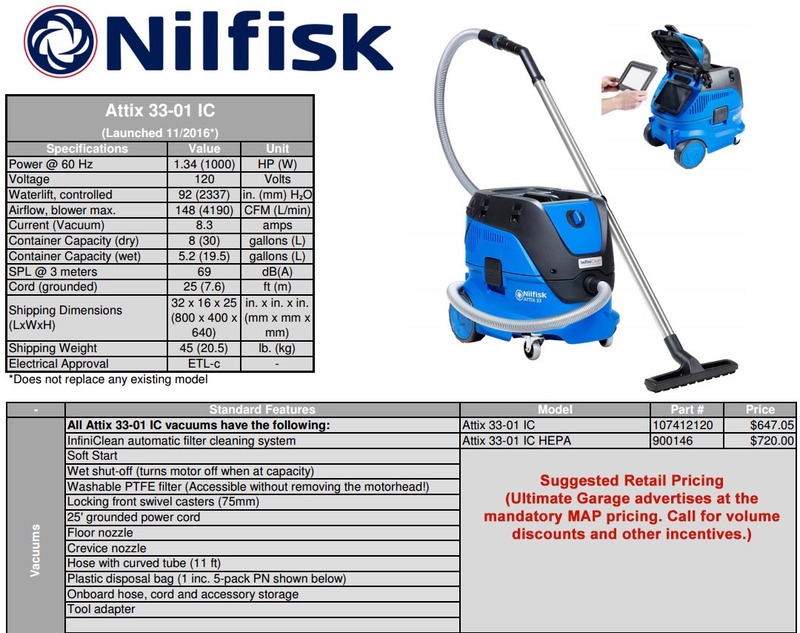 Nilfisk Attix 33-21 InfiniClean™ Vacuum with Autostart & HEPA (Freight!) 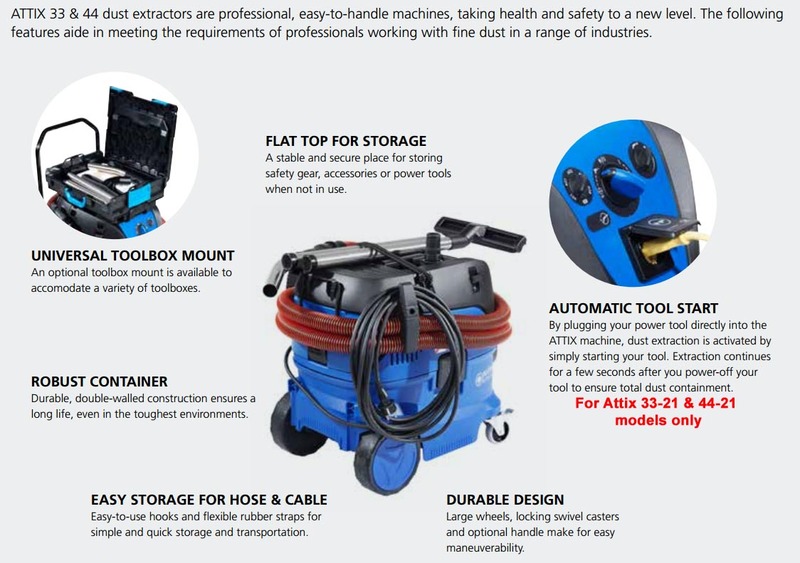 - the Attix 33 (8 gallon) and Attix 44 (11 gallon) vacuums could possibly be the most significant vacuums to come out of Nilfisk/Alto's "blue line" since the introduction of the Attix 8 & 12 back in 2005. That's a bit of a bold assumption, especially considering I haven't had a chance to test one yet. Initial impressions are very positive. a. New InfiniClean (IC) filter cleaning system. Engineered to work without filter bags. 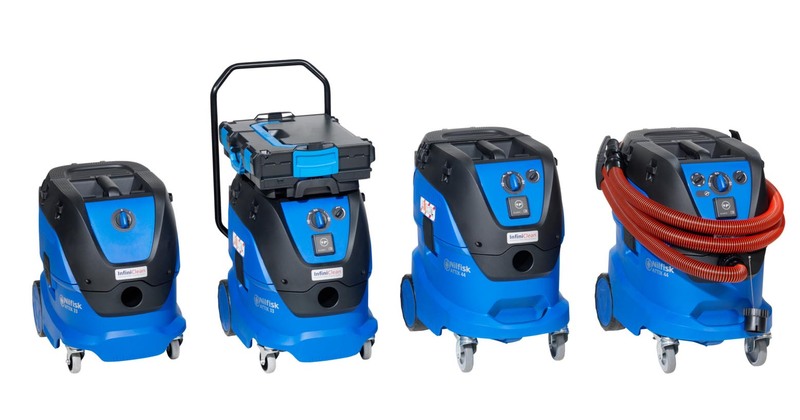 The InfiniClean filter system can be disabled on the autostart (33-21 and 44-21) models, important when working at lower suction levels or in quiet environments. This prevents the machine from ramping up motor speed during the filter cleaning cycle (every 15-20 seconds). b. Washable PTFE filter that can be changed by lifting the rear hatch door on the vacuum. No need to remove the heavy motor head assembly. The PTFE filters are non-stick and easier to clean than the previous PET fleece filters. e. Exhaust air adapter available as an inexpensive option to direct air outside the work zone (through one of the stock hoses). Great for working in clean areas and auto detailing shops. f. Improved chassis. Rugged double wall canister with larger rear wheels and new locking (steel) front casters. g. Improved air flow compared to previous models. h. Flat top design for improved tool storage. Optional mounting kit for Sortimo L-Boxx or Tanos Systainer storage boxes. i. Lower center of gravity compared to previous models. Less top heavy means less chance of tipping. The new machines both measure 15.2" wide by 22.2" long. The Attix 33 models are 20.5" tall and the Attix 44 models 23.8" tall. j. Available as a true HEPA vacuum (great value when ordered new as a HEPA model). Non HEPA models can be upgraded....more costly. k. Available 3-stage filtration for additional safety when working with hazardous dust.....main PTFE filter, HEPA filter and fleece filter bag. Impressive for a machine at this price point. l. Common consumables - despite the 3 gallon difference in capacity between the 33 and 44, both machines use the same filters and bags. This is a convenience if you own and have to stock parts for both machines. 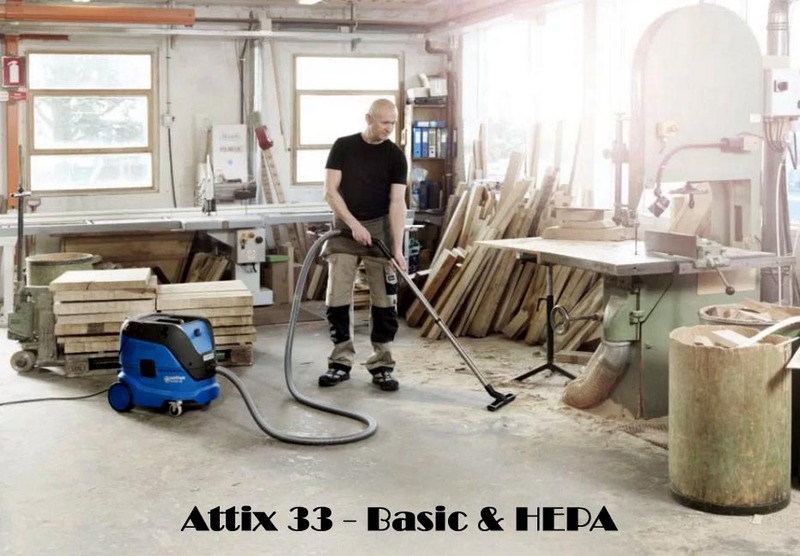 The Attix 33 IC HEPA is the Basic IC model with the addition of the HEPA filter element and HEPA filter cover kit. The HEPA version is only $60 extra than the non-HEPA model and the only one I am stocking. To add HEPA at a later date will cost $155.00. 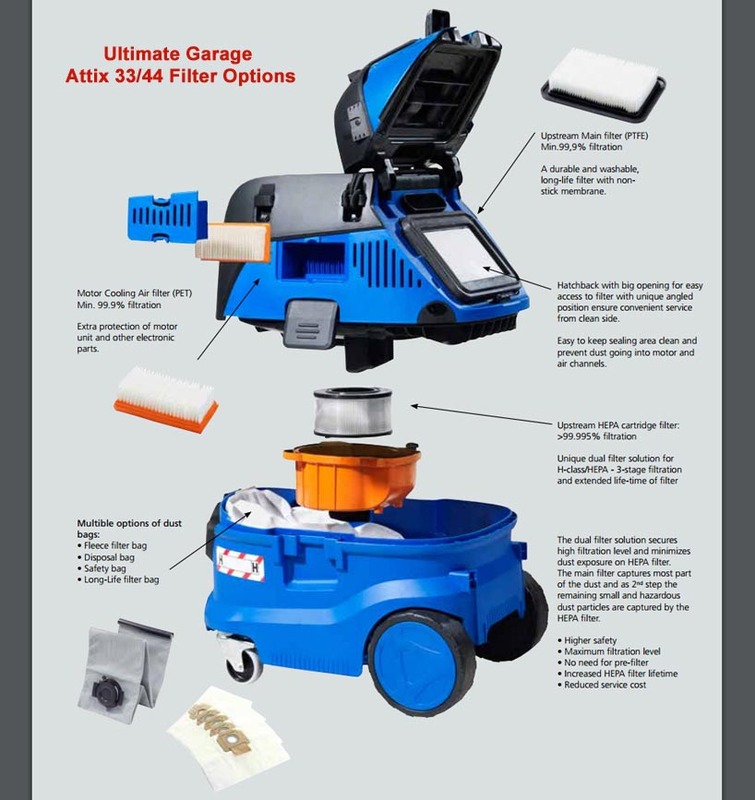 This is nice improvement over the previous Attix 30 XC HEPA and great for painters and contractors working working with lead paint or other nasty materials and HEPA filtration and tool triggered autostart for their saws or sanders. 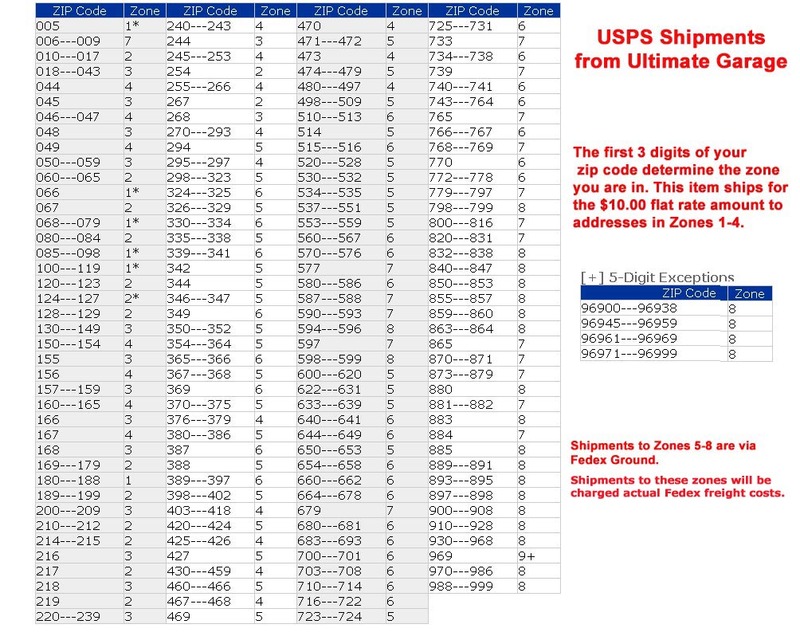 Freight - additional freight costs will be due if the ship to address is Zones 5-9 (click on Zone photo to enlarge) There are additional savings for local pickup or shipping using your Fedex account. See details.